Bariatric surgery offers an effective method of long term weight loss for the obese patient. The increase in the number of bariatric patients undergoing surgery means that an understanding of how to provide high quality nursing care to this challenging group of patients is vital. The provision of specialized nursing care, based on up to date research and knowledge will have a positive impact on the patient’s journey. This chapter deals with multidisciplinary approach to the preparation of the patient for surgery and the prevention and early recognition of perioperative/postoperative complications. 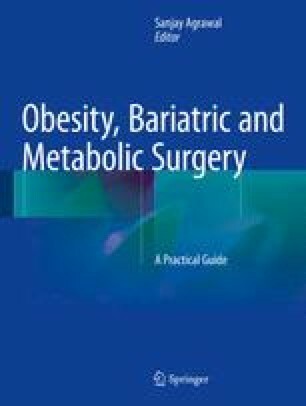 O’Kane M, Pinkney J, Aasheim E, Barth J, Batterham R, Welbourn R. BOMSS Guidelines on perioperative and postoperative biochemical monitoring and micronutrient replacement for patients undergoing bariatric surgery.2014 Sept. Available from: http://www.bomss.org.uk/bomss-nutritional-guidance. Accessed on 05/01/15. WHO Guidelines for Safe Surgery 2009: Safe Surgery Saves Lives. Geneva: World Health Organization; 2009. Available from: http://www.ncbi.nlm.nih.gov/books/NBK143243/. Accessed on 17 Feb 2015. The Royal College of Surgeons. The consultant surgeon and the consultant-delivered service; 2009. Available from: https://www.rcseng.ac.uk/publications/docs/the-consultant-surgeon-and-the-consultant-delivered-service. HoverTech International. Hovermatt Air Transfer System; 2014. Available from: http://www.hovermatt.com/hovermatt.html. Accessed on 03/12/14. National Institute for Health and Clinical Excellence. Venothromboembolism: reducing the risk. NICE Clinical Guidelines 92. London: NICE; 2010 Jan. Available from: http://www.nice.org.uk/guidance/cg92/resources/guidance-venous-thromboembolism-reducing-the-risk-pdf. Accessed on 03/12/14. Aircast Vena Flow. Intermittent pneumatic compression device instruction leaflet. 2012. Available from: https://www.ucare.org/providers/Resources-Training/Medical-Policy/Documents/Pneumatic%20Compression%20Devices.pdf.